1. The function f is defined as f(x)= √x-3. Its domain is x ≥ 3, and its range is f(x) ≥ 0. Which of the following is true of f? If x ≥ 3, then f(x) ≥ 0. It assigns exactly one value to every positive value of x. The range of the function is f(3). The value of f(3) is undefined. 2. If g(x) = 3x + x + 5, evaluate g(2). 3. The function S(r) =4 rπ2 gives the surface area of a sphere of radius r. What is the surface area of a sphere of radius 4? 4. A theater will sell 500 tickets to a play if it charges $10 per ticket. Furthermore, every time it raises the price by one dollar, it will sell 50 fewer tickets because some people will think it too expensive. Which of the following functions t(d) represents the number of tickets the theater will sell if it charges d dollars per ticket? 5. A taxi ride costs $4.25 for the first mile and $0.70 for each mile after the first. Which of the following functions c(d) gives the total cost (in dollars) of traveling d miles (assuming that d ≥ 1)? 6. Exponential functions grow by equal factors over equal intervals. By what factor does the exponential function f(x)=3-2x grow by over every interval whose length is 3? 7. A linear function can be used to convert a temperature from Fahrenheit to Celsius. For example, you can use it to convert 32oF to 0o C and 68o F to 20oC. Use this information to convert 104o F to Celsius. 8. 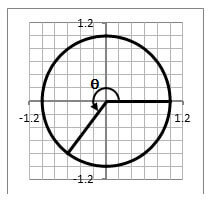 In the figure below, circle O is a unit circle, and the measure of ∠ AOB is π /3. 9. A unit circle and an angle are graphed on the coordinate plane below. Use the graph to calculate the value of sin . 10. Calculate the value of tan π /6?. 1. A: The function f assigns to each element of the domain exactly one element of the range. Consequently, if x is in the domain x ≥ 3, then the value of f is in the range f(x) ≥ 0. Therefore, the correct answer is choice A. On the other hand, choice B is incorrect because f is not defined for some positive values of x, like x = 1. Choice C is incorrect because the range of f is f(x) ≥ 0, not f(3). Finally, choice D is incorrect because the value of f(3) is defined since x = 3 is in the domain of f.
= 64 π Therefore, the surface area of the sphere is 64π. 4. B: Since the theater will sell 500 tickets if it charges $10 per ticket, we know that t(10) = 500. Furthermore, because of the way ticket price affects ticket sales, t must be a linear function that decreases by 50 every time d increases by 1. Therefore, the d-term of the function is 50d, so the function takes the form t(d) = 50d + c. To find the value of c, substitute 10 for d and 500 for t(10) and solve for c.
Thus, the function is t(d) = 50d + 1000. 5. D: The cost of the taxi ride is the sum of two functions, a constant function for the first mile and a linear function for the rest of the ride. The constant function is c1 (d)=4.25 since the cost of the first mile is $4.25. For the linear part, subtract 1 from d to exclude the first mile, and then multiply the result by 0.70 since it costs $0.70 per mile. The result is c2 (d)=0.70(d-1). Finally, write the function for the total cost of the taxi ride by adding the two functions. Since f(0) = 3 and f(3) = 24, the function grows by a factor of 24/3=8 over this interval. 7. C: Linear functions grow by equal differences (rather than equal factors) over equal intervals. In other words, if the linear function c(f) converts a temperature f from Fahrenheit to Celsius, then intervals of equal length (in f) result in equal increases in the value of the function c(f). From the problem, we know that c(32) = 0 and c(68) = 20. Thus, we can conclude that intervals of length 36 (like the interval [32,68]) result in an increase of 20 since 20 0 = 20. In addition, since the length of [68,104] is 36, the function c(f) increases by 20 over this interval as well. Use this information to calculate c(104). Therefore, we can conclude that 104 F is equivalent to 40oC. 8. B: An arc is a piece of a circle. 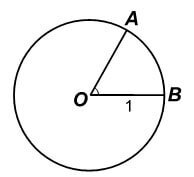 In the figure, AB is the piece of the circle that starts at point A and ends at B. In general an arc length s is given by s = θR, where R is the radius of the circle containing the arc and ? is the angle subtended by radii drawn to the endpoints of the arc. In a unit circle, the length of an arc is simply the measure of the angle (in radians) subtended by the angle. Therefore, the arc length of AB is equal to the measure of ∠ AOB, so its length is π / 3. 9. A: In a unit circle, trigonometric functions can be represented by considering angles that start from the positive side of the x-axis and are measured counterclockwise around the circle. For angles like this, the sine of the angle is the y-coordinate of the point where the angle’s side meets the unit circle. Since one side of the angle meets the unit circle at ( 0.6, 0.8), the value of sin θ; is 0.8. 10. B: The angle π / 6 is in radians. To convert it to degrees, multiply by 180/π. Therefore, tan π / 6=tan 30o . To calculate this value, draw a 30-60-90 triangle, which is a special triangle whose proportions you may have memorized. Making the hypotenuse one unit long simplifies things, although it is not necessary as long as the proportions are the same. Alternatively, remember that tan θ = (sin θ) / (cos θ). You might have memorized the sine and cosine of 30° as 1/2 and √3/2, respectively. This is the same division as above, and yields the same answer.